Volkswagen have a trend of been associated with motor sports or any other sports event in Europe and other countries. In India, they have started the Volkswagen Polo Cup series. But last night, Volkswagen India introduced a new variant of the Volkswagen Vento and named it as the Volkswagen Vento IPL edition. Needless to say, for the cricket crazy Indian fans, this should just be another reason to buy a Volkswagen Vento. The car has been regularly contributing to the Volkswagen coffers and has even went on a waiting list since its launch a few months back. This is just the beginning of the global ‘action’ model concept that Volkswagen plans to introduce with all its models here in India. The launch of this variant couldn’t have come at a better time than the 4th season of the Indian Premier League which is due to commence once the ICC Cricket World Cup 2011 ends. 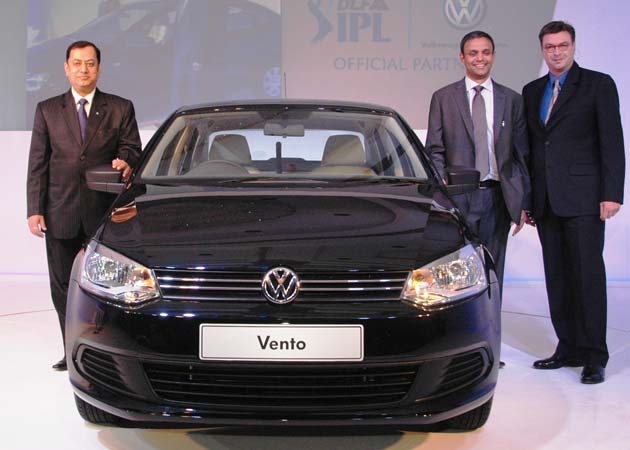 The Volkswagen Vento would be the official partner of the IPL cricket theme. It can be recalled that Hyundai are the official partners for the ICC Cricket World Cup 2011. The new Volkswagen Vento IPL edition gets a much needed color multimedia touch screen which boasts of a navigation system, leatherette seats with the IPL logo and door sills with the IPL logo. For the multimedia system, there would also be Ipod connectivity, micro SD, parking assist, mini USB interface and also Bluetooth function. Moreover, the floor mats also have the IPL logo on them. To sweeten the deal, Volkswagen are also offering cricket kits as giveaways with the Vento IPL edition. Unfortunately there are no steering wheel mounted controls as of yet. On the exterior, the car boasts of having IPL decals at its rear and on the sides. The wing mirrors have slightly changed and are not body colored but some cheap plastic types. Prices for the new variant start from Rs 7.24 lakhs. However hold your horses as this variant would go on sale from the starting of April 2011.